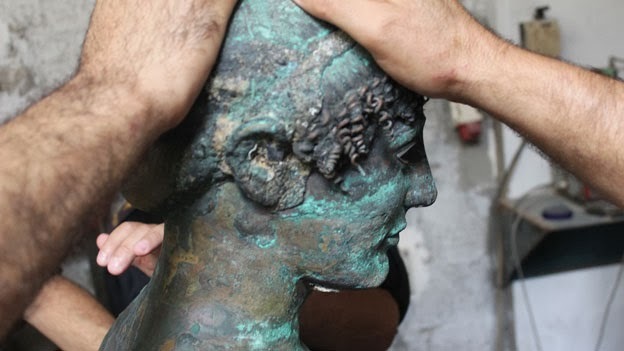 A statue thought to be an ancient bronze of Apollo, Greek God of poetry and love, has dropped off the radar after being found in the sea off Gaza last summer and surfacing briefly on eBay. It is 2,500 years old and priceless. 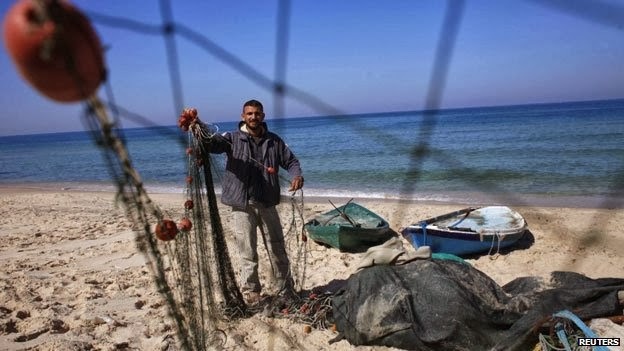 Jawdat Abu Ghurab used to be a builder but in 2007 Israel restricted the delivery of building materials to the Gaza strip, so he became a fisherman like his father. He only has a small boat so never goes out far, and catches only small fish. One day last August, though, the 29-year-old from Deir al-Balah ended up with a very different haul. His uncle was also fishing that day, but gave up early. Ghurab kept going. "I stayed alone in the sea with a small boat and paddle, I waited for hours and did not imagine what fate had in store for me in the depths of the sea," he says. "Sometimes waves move the bottom of the sea, small fish go to that spot in search of food, I saw the fish congregate in an area not far from the coast, only 100m out, so I rowed out there and, immersed in the sea, I saw the body of a person, half-buried under the sand." At first Ghurab was scared. He stared into the water but did not recognise the man's face. When he dived in and touched the body it felt like stone. "I tried to move it, to make sure that it was a statue, but it was too heavy," he says. "The colour was golden so it was easy to think it was gold." Ghurab marked the spot and went back to the beach to fetch his relatives. They returned and dived down together - it was at a depth of about four metres, Ghurab estimates. "We were able to slide it under the water for a metre or two metres and then go up again to take a breath and try again," he says. After four hours they succeeded in getting the object out of the water. It was the statue of a naked man. They loaded it on to a cart and took it to Ghurab's house. "My wife covered her face when she saw him lying naked in the house. She begged me to cover it," he says, laughing. Ghurab's uncle, Atef, proposed cutting the statue into small pieces and selling it. suggested cutting off the finger and taking it to the market to check.We remembered that one of our relatives worked in the neighbourhood selling gold. We called him and he examined the statue and told us that it was made of bronze." But he also said the bronze statue could be even more precious than if it had been made of gold. 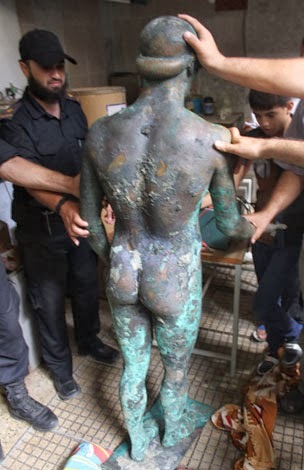 Ghurab considered trying to smuggle the statue into Egypt to sell it, but the smugglers' tunnels - dug to circumvent restrictions put in place by Israel and Egypt after the Islamist movement Hamas came to power in Gaza - have been out of action since they were closed by the Egyptian army last summer. Neighbours started asking questions, so Ghurab asked a relative - a commander in Hamas's military wing, the Izz al-Din al-Qassam Brigades - to help him hide it. "The people who took the statue said they would send me a handsome reward after they sell it, but we have not got anything yet," he says. For a while it was for sale on eBay, with an asking price of $500,000. Then the listing disappeared. Ahmed Elburch, an official at the Hamas-run Ministry of Tourism and Antiquities in Gaza, says he last saw the statue in October. He was concerned about its condition, he says, as the colour appeared to be changing, and one of the eyes had been cut out. He says a request from the Louvre to borrow the 500kg, 1.75m statue is currently being studied. Hamas police refused my request to see it. People living in the north of the Gaza Strip say it is still being held by militants, who have refused to hand it over to the Hamas government. But no-one can be sure. 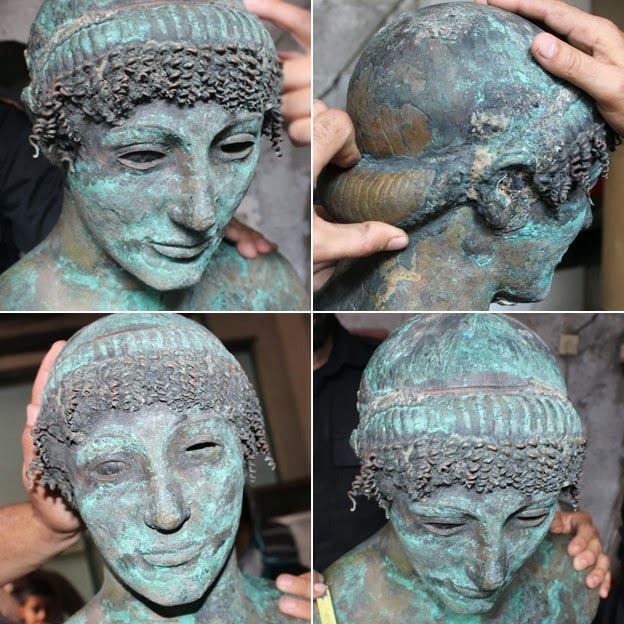 Listen to Shahdi Alkashif's report on the missing statue on The Fifth Floor, on the BBC World Service, or download the podcast.